From the time I was 15 years old I was already making music lists of my favorite songs and albums. In the beginning these lists consisted mostly of Deep Purple (Black Night live was at number 1 for a long time) supplemented with some Uriah Heep, Led Zeppelin and the occasional “odd man out”. For example, The Sweet’s Fox on the Run was on the list for a while, despite the fact that my good friend Frank thought (and still does) that this song didn’t belong there. Maybe I will someday find those old lists again, then I would surely put them on this page. The oldest I’ve been able to find up until now was made on December 15th, 1979 and you can see it below, my former L.P. Poll of all times. To be honest I’m still quite content with what’s on the list. I had an obvious preference for live double albums, that much is certain. 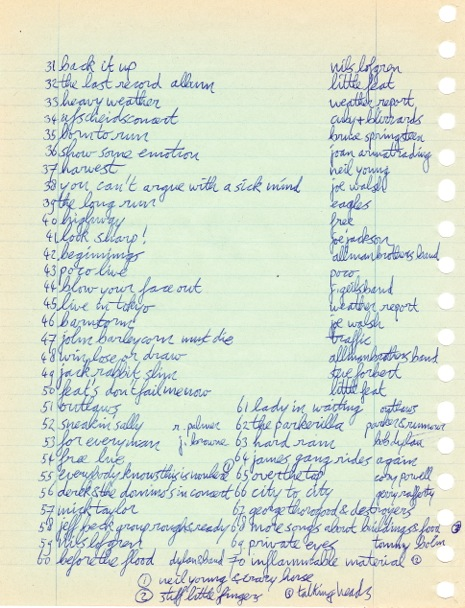 The most surprising title for me is Word Salad by Fischer Z at number 12. I now remember I received it during ‘Sinterklaas’, ten days before compiling the list, so that explains why it ranks so high on the list. I should play that record again to see how I feel about it now. 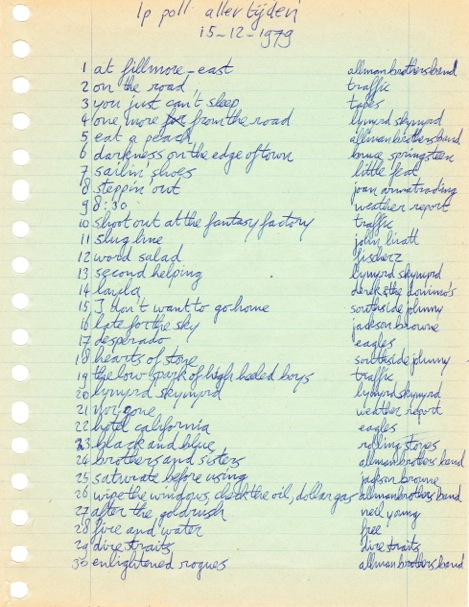 Throughout the years lists continued to play an important part in my musical life, along with wish lists of course. On this page there will certainly be the annual album lists but possibly also different lists. Sometimes there will be annual lists the way I made them back then if I can find them but more often, there will be lists in the way I would make them currently, now that I’ve heard much more music and my taste has also developed. 2013 And a temporary list from 2012 are already there and 2014 will follow as soon as possible once the year is over. As for the rest there will be a lot of listening and searching my archives to find lists from previous years, I’m looking forward to it! On the subpages, which you can reach by clicking on a date in the right sidebar, you can view the lists that I have already put under that specific year.